10 Barrel Brewing Co. was born in the middle of, and helped contribute to, one of the biggest craft beer movements in the US, which is in the Pacific North West. Since being founded in 2006, in Bend Oregon, 10 Barrel Brewing has brewed plenty of delicious and awarded beers. And it was all because a set of twin brothers were fed up living in the dull, monotonous corporate life. Twin brothers Jeremy and Chris Cox were living Portland, Oregon working in corporate jobs that left their lives boring. So, they started brainstorming to find a way out of their cubicle jail cells. After deliberating they decided they wanted to find an occupation that they could do in one of their favorite cities, Bend Oregon, and narrowing down their options they decided to open a bar. JC’s Bar and Grill was opened in 2003 and soon became a popular hang out spot for many locals. Even with the immediate success, the bar wasn’t enough for Jeremy and Chris to leave their corporate jobs. They were still working in Portland during the week, then would drive to Bend every weekend to run the bar. With further brainstorming and a new love for craft beer they discovered while running the bar they started floating the idea around of brewing their own beer and starting a brewery. After a couple of years of planning they finally quit their corporate jobs, partnered with their friend Garret Wales, and founded Wildfire Brewing Company. All 3 were novel to brewing so they hired Paul Cook to be the head brewer, who had previously been working at Deschutes Brewing Company. Unfortunately, a year after being founded they faced legal difficulties with the name “Wildfire” because a restaurant chain already had the rights to it. Instead of fighting it they concluded to changing their name, which came to be 10 Barrel Brewing Company. At first the going was tough, but they were still making great beers and weren’t going anywhere. It wasn’t until 2009 when they expanded distribution to Portland that things really took off for them. In addition, to help fuel their growth they opened a brewpub in Bend that they could serve their beers out of with food. This growth brought demand that they couldn’t keep up with at their original brewhouse. In 2012 they opened a larger new production brewhouse to keep up with the newfound demand for their beers. This new brewhouse also gave them the capability of expanding, which they did in 2013 to Washington and Idaho. But it was the following year that brought the biggest change for 10 Barrel. In 2014 10 Barrel announced that they were partnering with Anheuser-Busch (AB) and became a member of AB’s “The High End” which is a family of craft breweries AB has purchased or partnered with. With this change 10 Barrel didn’t necessarily sell out like a lot of critics voiced. Instead with this partnership they are able to use AB’s vast resources to further grow the 10 Barrel brand. Since the partnership, 10 Barrel has further expanded distribution to more western states as well as the Midwest. They also opened a handful of brewpubs in cities like Boise, Portland, Denver, and San Diego. This well-crafted sour sampler is going to help you CRUSH it while you enjoy your summer to the fullest. Backyard games with friends and neighbors? CRUSH it! Looking for a delectable beverage while working on a yard project? CRUSH it! Need a beverage that everyone will love while hosting friends and family at the lake? CRUSH it! A well-deserved relaxing afternoon without interruption? CRUSH it! Whatever it takes for you to enjoy yourself this summer 10 BBL CRUSH sampler has your back! 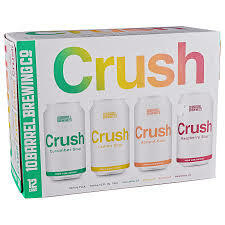 The CRUSH SAMPLER includes 3 cans of each of the following flavors!